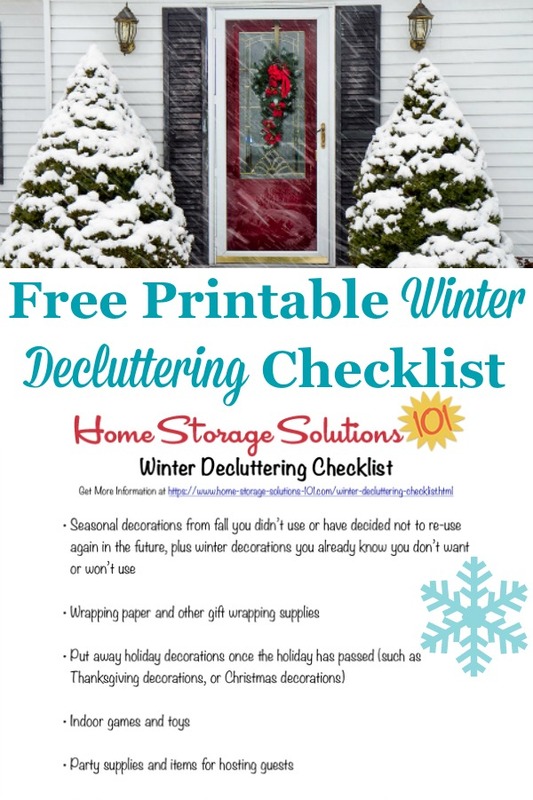 Here is a free printable winter decluttering checklist that you can use to get rid of clutter around your home when cold weather begins. Winter is a season, because of the cold, that we stay inside, trying to stay cozy and warm. Because you're inside so much, it's also often a time you begin to notice all the stuff you've got in your home, and makes you consider what you could get rid of, to make more room or make the space feel less cluttered. Also, because at least here in the Northern hemisphere it is winter time when we have lots of holidays, like Christmas, it's a time that a lot of new stuff comes into our home as gifts. That means, so things don't get cluttered, we need to focus on decluttering excess as well. 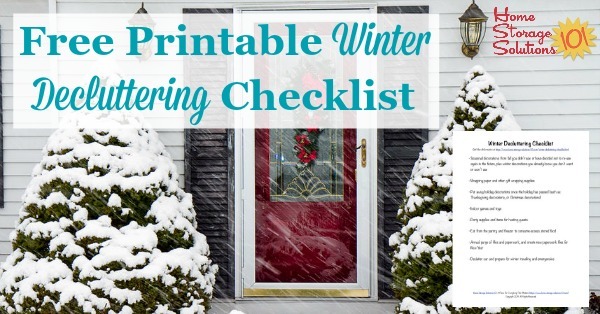 Below is my checklist of things you should declutter from your home in the winter to get you going (I've listed them first in the article itself, with links to other articles on the site which will help you do all these decluttering tasks, and then below that is the the free printable PDF version of this checklist). 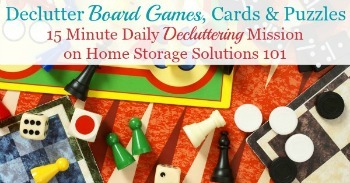 Please note, many of these decluttering tasks will look familiar, because many of them are items I've added to the Declutter 365 calendar around when the season changes from fall to winter, mainly in the months of December, January and February. There are lots of seasonal and holiday decorations you may have used this past fall, such as the holidays of Halloween or Thanksgiving, that it's time to put away now that the seasons are changing, until their used again next year. 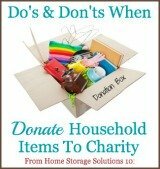 Or if you don't want to use these items again, or never even got them out it may be time to actually get rid of them from your home. 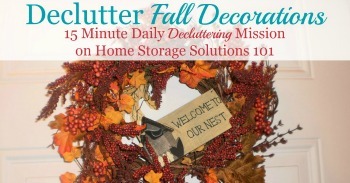 You can get tips for decluttering fall decorations here. In addition, several holidays occur during winter (at least in the Northern Hemisphere) including Christmas, which is often a holiday a lot of people really decorate for, a lot. As you get out decorations to prepare for the season, and later put away these same decorations, use the opportunities to get rid of anything you no longer want or need, so it's easier to organize and store what you have left. 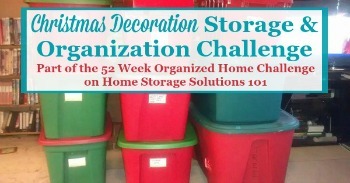 You can get lots of ideas for decluttering and organizing Christmas decorations in the Christmas Decoration Storage & Organization Challenge here on the site. 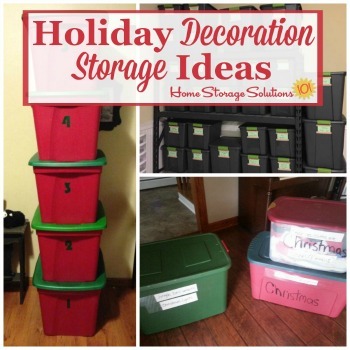 In addition, here are ideas for holiday decoration storage, for the items you'll put away but are keeping for next year. Just like it makes sense to declutter seasonal holiday decorations during, before and after their use, in the season in which the holidays occur, it makes sense during the Christmas season to also declutter wrapping paper and other gift wrapping supplies. See what all you've got already, and make a point of using it while wrapping presents. If you've got too much to use within a reasonable time, get rid of some of it now, as well, so it's not left to waste. 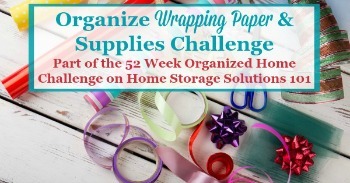 You can get lots of ideas for decluttering and organizing these supplies in the Organize Wrapping Paper & Supplies Challenge here on the site. Kids outgrow toys, and also can be rough on them so they break, or become worn out. 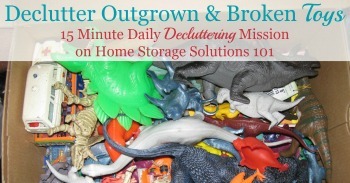 In addition, as kids get new toys some of the older ones need to be decluttered to make room for the new. This especially is important to do when there's a big influx of toys, like around Christmas, so winter is a great season to do a purge of these items. Winter is also a time you may do entertaining, either with parties or overnight guests. 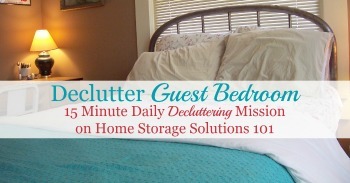 To the extent you've got to clean up your home anyway to get ready for guests, it's a great time to do some decluttering as well. Use up extra party supplies, like napkins, paper plates, etc., as well as clear out and declutter the guest bedroom to make sure your guests have a nice place to sleep. Stocking up with food for your pantry and freezer is a good idea, to help you save money, and make sure you've got enough food when the weather gets bad and it's harder to get outside. But at some point you've got to make sure you eat up that food as well, so it doesn't go to waste. 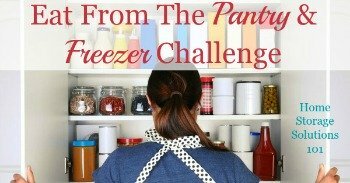 Winter is a perfect time to do that, so I suggest during this season that you do an Eat From The Pantry & Freezer Challenge to reduce food waste, save money, and declutter your pantry and freezer all at the same time. Winter also is the time that we usher in the New Year (at least in the Northern Hemisphere), and since some paperwork only needs to be kept for a certain number of years, as the year changes it's a good time to declutter some of your excess paperwork. 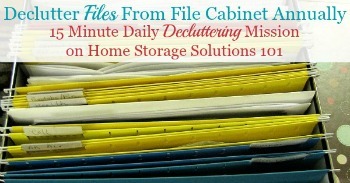 I call this an annual file purge, and you can find out how to do it at the link. 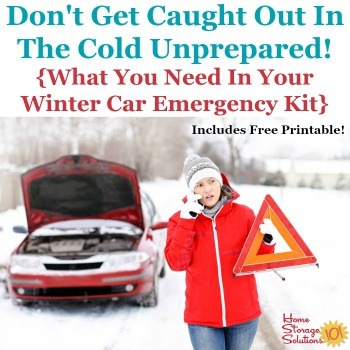 While you drive your car year round, and therefore need to have it decluttered most of the time, you do need to make sure you're prepared for winter traveling, especially. Here's tips for decluttering your car's interior, plus make sure you've got your car emergency kit stocked for winter driving. 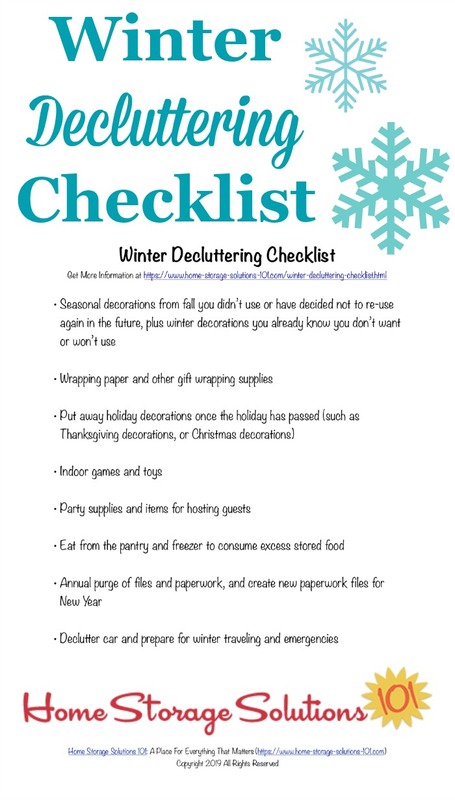 I hope this winter decluttering checklist helps you get ready for the changing season around your home. 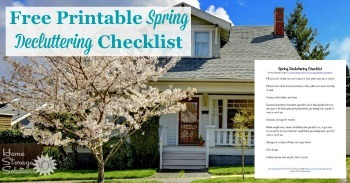 In addition, if you want to get ready for the next season, make sure to also check out the spring decluttering checklist here on this site.